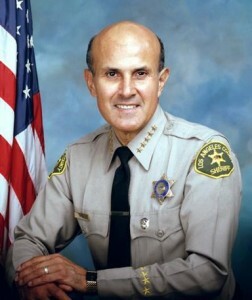 LOS ANGELES – Jury selection resumed Thursday in the second trial of former Los Angeles County Sheriff Lee Baca on federal corruption charges for allegedly conspiring to obstruct an FBI probe into possible abuse of inmates in the county jail system. Jurors are being selected from a pool of more than 200 people who are undergoing questioning at the new federal courthouse in downtown Los Angeles. Potential panelists from throughout the region were excused from serving Wednesday based on hardship issues and others are expected to be rejected because of their perceived viewpoints on the sheriff’s department and how much they already know about the case. U.S. District Judge Percy Anderson said jurors would remain anonymous due to the media attention the retrial is expected to draw and to lessen the chance that they are contacted during the proceedings. Jury selection, which marks the start of a trial, may last the rest of the week. Baca, 74, was tried in December on counts of obstruction of justice and conspiracy to obstruct justice, but jurors deadlocked 11-1 in favor of acquitting the former sheriff. Anderson then declared a mistrial. The case against Baca focuses on a period of time when sheriff’s deputies based at the Men’s Central Jail stumbled upon a secret FBI probe of alleged civil rights abuses and unjustified beatings of inmates within jail walls. Baca maintains he had no knowledge of what was being done in his name by subordinates, including former Undersheriff Paul Tanaka. Tanaka is serving a five-year prison term for his conviction on obstruction of justice charges similar to those Baca faces. Eight other former deputies were convicted and are serving time in the case. Baca’s lawyers had asked the judge to allow UCLA psychiatrist and Alzheimer’s expert Dr. James Spar to link Baca’s alleged criminal actions to a years-later diagnosis of mild cognitive impairment. Baca’s attorneys contend that the ex-sheriff is in the early stages of Alzheimer’s disease and suffered some cognitive impairment as long as six years ago. The judge also granted a prosecution motion to prevent the defense from introducing testimony about Baca’s “prior good works,” which did not directly pertain to the charges for which he was being tried. And Anderson banned Baca from wearing his mini-sheriff’s star lapel pin, as the former lawman had been doing for court appearances since he was first charged in February 2016. Prosecutors wrote that by wearing the star, Baca was attempting “to portray himself as a law-abiding reformer” to the jury without ever taking the stand.